Brasseries Georges is one of the veritable culinary institutions of Brussels. Sitting opposite the Bois de la Cambre, in the upmarket quarter of Uccle, Brasseries Georges is equally known for its fresh shellfish stand –including mussels, oysters, shrimps and lobster– as for its variety of beef cuts. The menu even includes a drawing of a cow, explaining where the different cuts come from. I particularly like their fried potatoes, cooked in duck fat. Admittedly it might not be the healthiest option but they are tasty! 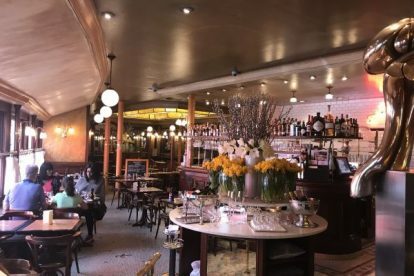 Brasseries Georges also boasts a classy interior, decorated with mahogany bars, shiny copper railing and large wall mirrors, dating from several decades ago when it first opened. It also has a nice terrace where the shellfish stand is usually displayed. One thing I like about this restaurant, apart from the consistency in the quality of its food and service, is its long and continuous opening hours. There aren’t that many places in Brussels where you can expect to order proper food continuously from lunch all the way to dinner. And to top it off, it comes with a voiturier service, so you don’t even have to worry about parking before digging in!